What is the Campaign Phase? The first step on the Pathway often involves the launch of a cross-organizational collaboration to address a specific issue that necessitates coordination from multiple organizations. This coordination usually takes the shape of a “campaign,” a focused, time-limited effort to align resources toward a shared goal that is implemented by a diverse group of stakeholders across a region. Campaign Phase collaborations attack a specific issue or crisis, often for a subset of the residents in the community, and for a limited time. For example, a successful Phase 1 effort in Shelby County, Tennessee was launched by a coalition of hospitals and other care providers, social service organizations, local businesses, and the faith community. This collaboration began by focusing on improving end-of-life care, reaching 100,000 people in the region to promote use of advanced directives and advanced care planning for residents. 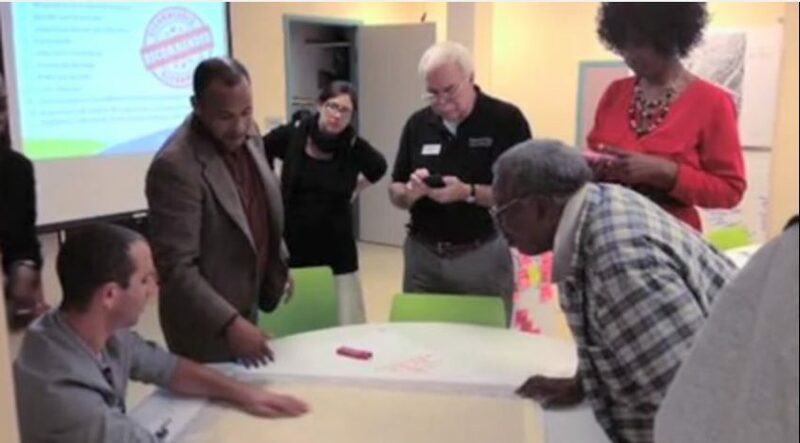 Another example of a Campaign Phase collaboration is the Community Solutions: Northeast Hartford Partnership—it is bringing together neighbors, businesses, public and private nonprofits, and government agencies to transform an abandoned factory into a center for community wellness, safety, and economic prosperity. A successful Phase 1 campaign is characterized by new, cooperative relationships being forged among leaders from diverse organizations that play a critical role in shaping health and care within that region. One of the critical challenges to overcome is forging trust with peer leaders who bring a different mindset and series of motivations to the table. Frequently, leaders who come from different organizations within a collaborative have a hard time connecting or getting past perceived barriers to cooperation. For example, it is hard to break down obstacles and work toward a common goal when leaders of competing hospital systems in a region have not had a history of collaborating. A key accomplishment in the Campaign Phase, then, is successfully meeting people where they are and building bridges to understanding roles, perspectives, and what it will take to work together. The joint work in this phase may be designed to limit risk to any one organization, and convened around a narrow purpose that has clear benefits for each of the participating organizations. Funding sources are mainly external grants targeted toward accomplishing campaign goals. they focus on accomplishing a piece of work jointly. Campaigns can play a critical role throughout the Pathway, serving to create momentum around key initiatives for any ongoing collaborative. However, whether an initial campaign is poised to move a collaborative to the second phase on the Pathway–the Engage Phase–depends on whether the stakeholders involved define their initial campaign as a starting point for further collaboration or see it as a limited effort. If the coalition was formed to address a specific problem, little collaborative capacity was created to foster more efforts to improve health. Therefore, senior leaders involved in the initial work, often step away from the campaign once it has been launched, transitioning leadership to the hands of operational managers who lack the power to do more. Transition to Phase II also depends on whether a cadre of well-positioned leaders begins developing a system perspective and a long-term view. Temporary and time-bounded purpose. Campaigns are typically short-term collaborations, leaving groups little time to build capacity for further accomplishment together. Project leadership, not stewardship. The most senior leaders of the key organizations involved in a campaign are often not the people ultimately managing the project; without them a campaign lacks the strong champions necessary to incite system-wide change. “We’ve done enough.” Once a successful campaign is completed it is common for participants to feel satisfied with what has been done, encouraging loss of motivation for further collaboration. Narrow scope, restricted vision. The narrow scope of a campaign limits the chances that the group will see and understand the whole system of health and the myriad issues that need to be addressed for true system transformation. Consequences: One problem solved, very limited broader system impact. Read the full descriptions of the Phase 1 Pitfalls. Conduct a common needs assessment. Turn a short-term joint effort into a platform for shared aspirations over the long haul by conducting the required community needs assessment together, rather than separately. Convene and launch a team of multi-sector champions. Leverage the engagement created by a focused campaign by creating an ongoing group of senior leaders championing real and lasting change. Surface dissatisfaction with the status quo. Build urgency about the need for change and vision around a broad definition of success that includes a wide range of shared values: health, prosperity, sustainable costs, and quality care for all. Develop systems thinking in a broad cadre of leaders. Use a wide variety of tools and broad-reaching conversations to sharpen understanding of the system of health as a whole and to build more empathic relationships with peer leaders. Consequences: Well-positioned leaders experience increasing urgency to do more together; initial accomplishments result in determination to do more together. Read the full descriptions of the Phase 1 Momentum Builders. Where do I see my role in our change efforts?